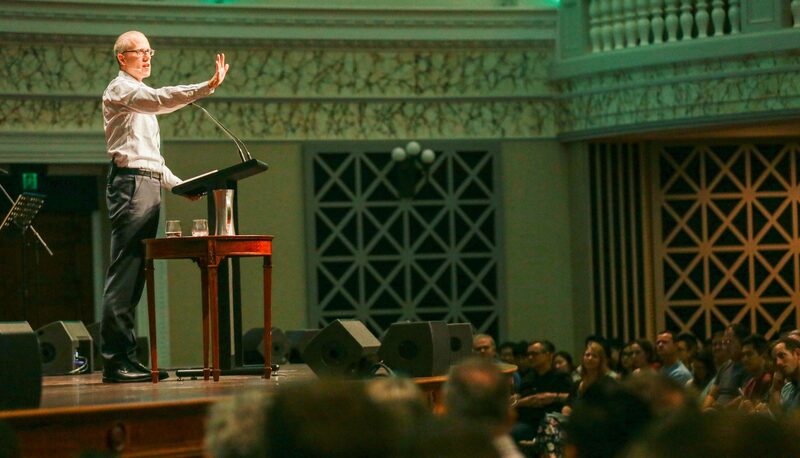 Last Sunday night, 1,400 Christians from various denominations gathered at Brisbane City Hall, for The Gospel Coalition Australia’s ‘Together for The Gospel’* Brisbane event. Guest speaker at the event was Kevin DeYoung, from the USA. As we sang God’s praises, heard from God’s Word, and listened to what God was doing across Brisbane, we were reminded of the increasing need to work together, for the sake of growing the gospel across Brisbane, Queensland, and Australia. Below is an edited extract from a short talk given on the night by the Chair of TGCA, Gary Millar, outlining the challenges and opportunities we face as Australian Christians—and how TGCA can help. The population of Queensland is now over five million people. Many of those people have never really understood the gospel of the Lord Jesus Christ. Many of those people have never heard the gospel of the Lord Jesus Christ. Many of those people have rejected the gospel of the Lord Jesus Christ. It is our privilege and responsibility to proclaim the power and beauty and glory of what God has done and is doing and will do for us in the Lord Jesus Christ to everyone in our great state. It is our privilege and responsibility to proclaim the power and beauty and glory of what God has done and is doing and will do for us in the Lord Jesus. We can only do that together. That’s why the Gospel Coalition exists. We can only do that together. None of us—no church, no denomination, no movement, no College, no ministry can hope to do enough evangelism, train enough people, plant or revive or strengthen enough churches to reach this whole state on our own. As gospel people—people committed to the Lord Jesus Christ—people united to Christ—we need each other as we seek to make disciples of all people here in Queensland and beyond. That’s why the Gospel Coalition exists. We want to help people to be clear and remain clear on what the gospel is. We live in a context where things are shifting fast—legislation is rapidly redefining how our society works. Old certainties are evaporating. In the middle of all this, we want to encourage everyone who belongs to Jesus to stand firm—to be really clear on what God has done in the Lord Jesus Christ, really clear on what it means to be a follower of the Lord Jesus Christ, and to be really clear on the unchanging message which we must announce to our changing world. That’s why we work so hard on the TGCA website, which now averages over 40,000 unique visits every month. We want to encourage people to make the gospel the driving force in their lives and churches. We are committed to Gospel Priority. The temptation right now is for us to try to block our ears to the sounds of our threatening, imploding culture, to curl up into a ball with the truth and hide. TGCA is all about encouraging God’s people to get on the front foot, to stay faithful, but to get the gospel out there as we do evangelism, and plant churches and love our world..
We want to encourage Gospel Networks—gospel relationships. Across Australia, and here in Queensland, we want to do everything we can to encourage and strengthen gospel people by introducing them to other gospel people. We long to see like-minded churches, whatever their label, praying for each other and cheering each other on in the same or neighbouring suburbs, rejoicing together in gospel growth, and standing with each other when we’re under pressure. That’s why, finally, TGCA is committed to establishing networks for the sake of the gospel where none exist. That’s why TGC Queensland exists. That’s why we’re here this evening. We’re here because there is no other opportunity for a gathering like this—where as brothers and sisters from across our state—and even a few visitors who have slipped across the border—can come together and stand together for the gospel of the Lord Jesus Christ—to encourage one another, to strengthen one another in proclaiming the gospel, to cheer each other on, to pray together for our state and our world. This is what TGCA is about. What Might Happen If Christians Stood Together For The Gospel? Let me dream for just a moment. Imagine Queensland in 10 years. Actually let’s be optimistic—let’s make it 5 years from now. How are things going in the church of the Lord Jesus in Queensland? Opposition may have increased, but the number of healthy churches is growing rapidly. In countless places across our state, the Bible is being clearly and warmly and engaging explained week by week. Christ in all his beauty is being held out to people, and they are becoming Christians, and being loved and nurtured, and are loving and nurturing others. In every suburb across this city, in every area beyond the city bounds, groups of gospel workers are praying together and walking with each other. It’s becoming more and more normal for like-minded churches to run evangelistic events and programmes together. Our relationships are dominated by gospel generosity, as we do everything in our power to help each other. The gospel temperature is starting to rise. City Bible Forum is being swamped as Christians from all over the city asking for resources and training as they meet to pray for their workmates, and share Christ with them. As a result, new Christians are turning up in churches all over the place. As are students from every nation and every campus in our state, as the work of AFES and other student groups is leading to more and more people coming to Christ and being trained in evangelism. What are we going to do with all these people? Of course, there is plenty to do in local churches, but we know that it would be greedy to keep these people! We have realised we need to send more people—more people to support struggling churches, more people to be part of new church plants, to train as pastors, and more people to be equipped to reach migrants and tradies and city workers and students and older people, and to work with children and young people, and to take the gospel to darkest NSW and to the ends of the earth. We are sending more people than ever on cross-cultural mission. More people than ever are asking to be equipped through apprenticeship programs like MTS and MTN. QTC and the other colleges are bursting to the seams, and having to employ more staff to keep pace! Churches who have been struggling start to get going, with help from the other gospel churches close by, and new churches are started, and strong churches are falling over themselves to help weaker churches. As gospel people, we’ll love to get together, hungry to hear Christ preached and to spur each other on—so the GROW women’s conference has moved to Suncorp and we’ll be outside at the Gabba. That’s what tonight’s about. This is the vision behind Together for the Gospel—this is what QTC is trying to play its part in. This is why TGCA exists—to encourage a flourishing ‘gospel ecosystem’ where each part does its work for the glory of Christ. Yes, we face challenges at this point in history—but this is no pipedream. Some of this—even much of this is already happening. Tonight is one small part of this. But tonight, we invite you to dream with us, to work with us, above all to pray with us—for the sake of the gospel. For the Lord Jesus himself has committed to build his church, and the gates of hell will not prevail against it. * Please note, this meeting was not organised by, or affiliated with, T4G (“Together for the Gospel”) US.